Whether most people see them or not, railroads are still the lifeblood of Chicago’s economy. But there once was a time when train lines were far more intertwined with daily life in the city than they are now. This old line runs along West Carroll Avenue — a street in River North many people don’t even know exists. It carried newsprint to the old Chicago Sun-Times Building before trucks made the line redundant. This was long before the Sun-Times building was torn down to make way for the Trump International Hotel and Tower (401 North Wabash Street). 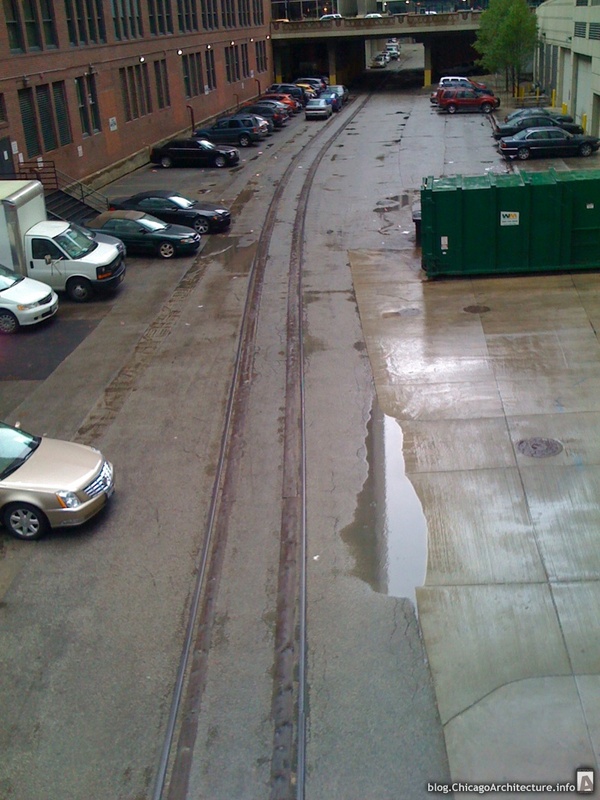 Mayor Daley would like to use the tracks to run a trolley or light rail service from Union Station to Michigan Avenue. But these days a lot of Hizzonor’s dreams are going unfulfilled for reasons that are beyond the scope of this blog. Interestingly, the reason the old Sun-Times Building was located along the Chicago River is the same reason the Chicago Tribune’s current print house at the Freedom Center (777 West Chicago Avenue) is also located on the river — so that newsprint could be brought in by barge. I’ve never seen any old pictures of newsprint being unloaded at the Sun-Times site, and I’ve read that the Tribune has never used its barge unloading capability at the Freedom Center. Coming from the one of the Kayak Tour guides, so take it for what it's worth, but was told there was a measurement issue with the Freedom Center doors and the paper was too big to get through when they tried. Interesting information. You're right to be cautious about tour guide information in this town. Unlike a lot of cities (Prague, Macau, etc…) there's no standardized training or licensing of tour guides in Chicago. I've heard some really amazing lies from Chicago tour guides. I remember one that said that the illuminated portion of the top of 311 South Wacker is a greenhouse. Another claimed said that the Wrigley Building and Tribune Tower look similar (they do?) because Wrigley owns Tribune! Sometimes I think they just make stuff up when they don't have anything to say.